"Simple to learn and provides many hours of general play without getting old." "Gives you more to enjoy without straining your wallet." "A classic word game that countless families have played on the typical game night for decades." "Solving problems and challenges while honing your guessing skills." "The perfect way to get younger children to practice their spelling and word-recognition skills." "Designed so that each round will present a new experience and challenge each time you play." "Create a friendly, competitive environment to pass the time as you celebrate this special occasion." The best word game is neither too easy nor challenging for the average player. This top pick is geared towards providing a great overall game experience while helping any player — but especially younger children — develop certain spelling and word-recognition skills they may otherwise not want to practice in a more academic environment. This game is also simple to learn and provides many hours of general play without getting old. Winning Moves Games’ Big Boggle is a simple word game that is easy to get into for anyone eight years or older. Using a timer, the game is divided into rounds where each player searches for adjoining letters in the randomly assorted grid. Earn points by making words of four or more letters. This game, intended for two or more players, is an Amazon Choice for its very high buyer ratings and comparatively low level of returns. The great thing about word games is they are generally affordable to begin with. Compared to more complex board and card games, a word game can be as simple as a crossword puzzle to solve on your own. This next budget-friendly word game, however, gives you more to enjoy without straining your wallet. For a test of spelling knowledge, Befuddled Games’ Kerfuddle Word Game is a great way to help young children review words or brush up older players’ spelling knowledge. Each player has to search and write down as many words as they can find before time runs out. To keep everything contained, the game comes with a handy container to store all of the cards and dice when not in use. This game is intended for two or more players aged 8 or older. Just as with board games, the word-game genre offers a set of classics that go back decades. 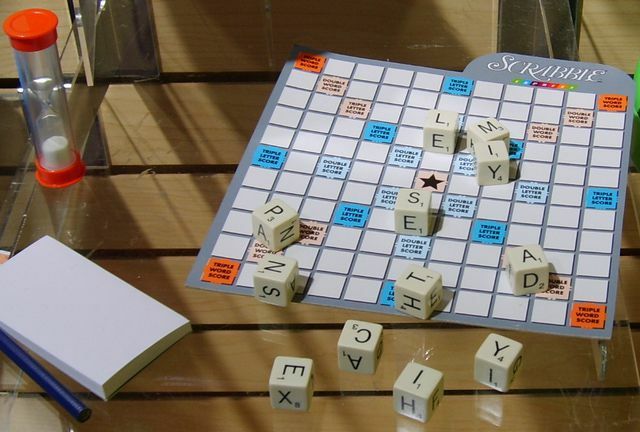 Hasbro’s Scrabble is a classic word game that countless families have played on the typical game night for decades. The gameplay is fairly straightforward: Form different words using randomly assorted letters. Each word is worth a different amount of points based on the letters used. The player with the most points over several rounds of play wins. Great for players aged 8 and older. This game is an Amazon Choice for high ratings, low returns and its relative popularity. How can you experience the same sense of thrill and adventure you get from a mystery board game while working on your spelling and word-recognition skills at the same time? The easiest way is with a mystery-word game. Taking a page from the popular game Password, Wonder Forge’s Banned Words Game forces you to describe words without saying them. Working with your teammates, try to make them guess five words in 90 seconds. The most guesses equal the most points. When you face a grid of seemingly random letters, on the lookout for familiar words that jump out at you across the page, you are engaged in a personal challenge that improves your language skills the more you do it. Combined with other players, though, a word search game is also a great way to test each other's skills in a friendly competition. Funster 52’s Word Search Puzzles are the perfect way to get younger children to practice their spelling and word-recognition skills. The game comes with large cards containing a 9x9 letter grid full of simple words. The print is large so players can clearly see where the words are in the grid. The game can be played solo or against others in a timed environment. The novelty wears off all games at some point. Word games, in particular, can become dry as you spell the same words over and over. Rewordable’s Card Game tries to keep things fresh, having been designed so that each round will present a new experience and challenge each time you play. If you want to help younger and older players alike improve their word recognition skills, Rewordable’s Card Game is an excellent choice. This game is all about building longer and longer words out of more common ones. Players receive a set of cards with word fragments they have to use to spell larger complete words. The idea is similar to the classic game Scrabble, but it gives younger players larger fragments to use. This game, originally a Kickstarter project, is ideal for players aged 7 and older. A good word game is a perfect way to bring some good-natured competitive fun (and some pre-wedding stress relief!) to a bridal shower. By giving everyone the same challenge to tackle — testing their spelling skills along the way — you can create a friendly, competitive environment to pass the time as you celebrate this special occasion.